How did it get to be Friday already? Now nearing the end of the women’s conference, the hour for goodbyes is not far away. What this means is that the rate of picture taking increases among us so we can capture that one last special moment of hugs and smiles before we part in tears. Where our cameras had measured the photos in hundreds per day, we will probably be in the thousands by later this evening! How special it is when sisters in Christ gather to share their faith, their hope, and their love. Each day when we have gathered in the morning, we have a time of worship. Elias and Petra lead us in song and prayer, we have a Bible study (these have centered on scriptures about women) and sandwiched in between is a theological reflection on our theme of hope. I had the great privilege today of presenting that reflection, and I took my cue from Marilyn’s on Tuesday about the people in our lives who have been witnesses of this hope that does not disappoint. I get the chance to tell about my sister Jana, on the screen behind me, as I speak of our journey of hope. I shared with the group that hope is a journey. Where fear freezes us in our tracks, tells us to stop, hope tells us to go. God is with us. He has already written the end of the story. I told them that I thank God every day for Facebook because it keeps this global community hooked together across the miles so that we can share each other’s stories. 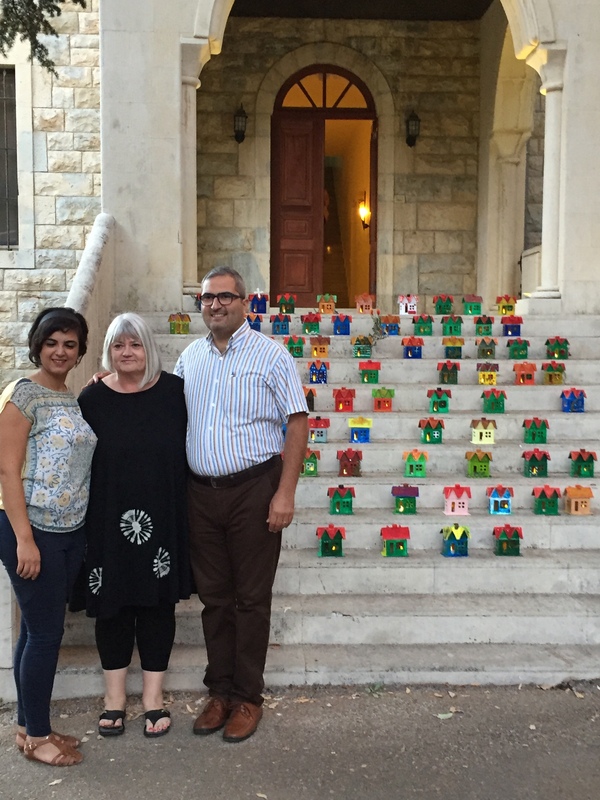 Most of my posts fall into three categories: my husband, the people of Syria and Lebanon (you can read my message about that in the most recent edition of The Outreach Foundation magazine here, just go to page 12), and my sister Jana. Jana’s life verse is that passage from Isaiah. She is head injured. She cannot speak clearly and walks with support, but has no strength in her body. And yet her life of hope brought me back to the community of faith, my church in Omaha. It was there I met my husband. Together the three of us are a family of faith. 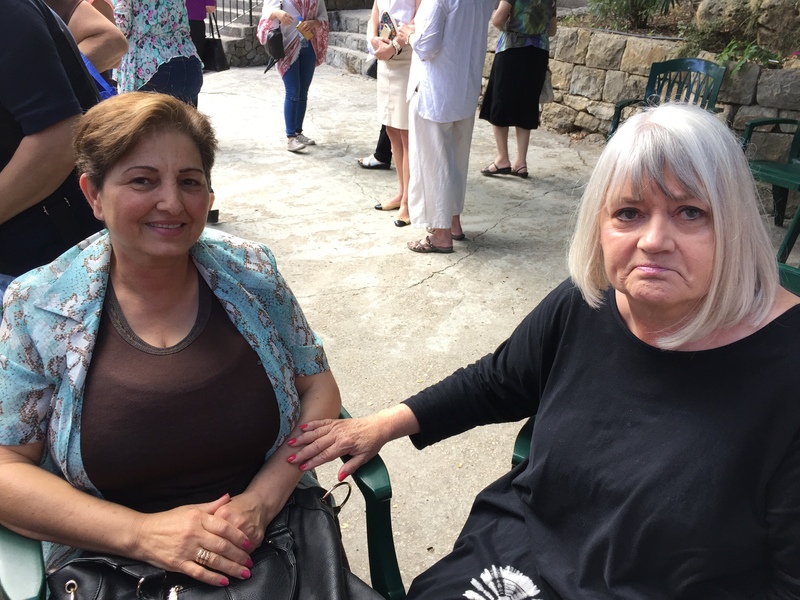 And it was from joining that church that I met Marilyn Borst who introduced me to the National Evangelical Synod of Syria and Lebanon and engaged me with the community in this place. Jana’s witness of hope, her waiting on the Lord, renewed her strength and mine, has allowed us to walk and run and soar in the journey that Jesus calls us to. 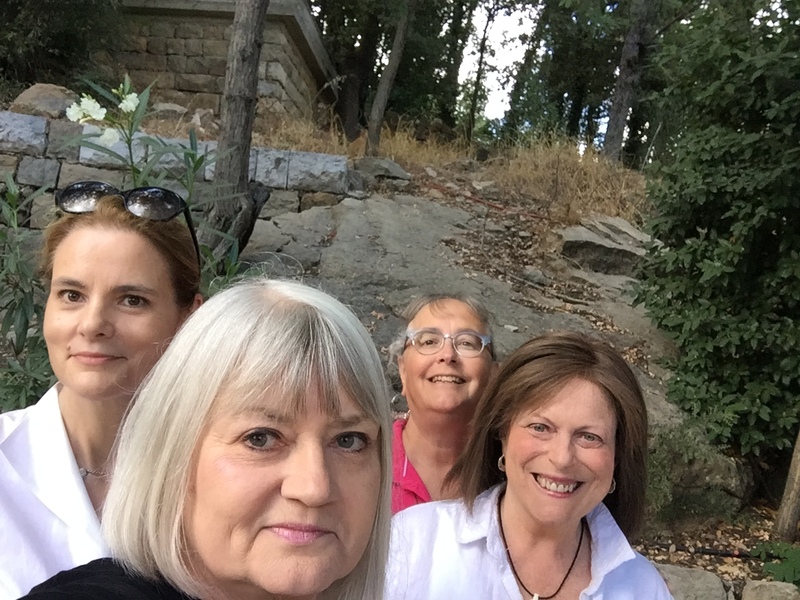 Our worship leaders Petra and Elias Jabbour surround our trip leader Marilyn Borst on the steps of the Cedar House in the city of hope. Elias’ Bible study on the story-in-a-story of the bleeding woman (Mark 5:21-43) was just the extra blessing I needed today about hope. As Elias told it, this story is the meat in the “Mark sandwich.” It interrupts the story of Jairus who wanted Jesus to heal his daughter. It was a great reminder that Jesus’ miracles are not feats of magic, but an invitation to those who are weak physically (like Jana) or spiritually (like me) to reach out in faith and grab onto Jesus, if only onto the hem of his cloak. Her healing restored her to the community, in fact, put her right back into the center of it as he singled her out for her faith. You see, fear says stop, but hope says go! Amal (which means hope) sits with Marilyn on the terrace. Amal is from Sweida, the town that lost over 200 in a terrorist attack on Wednesday. For some of us this day of hope began with sad news, a reminder that the war continues. At last report, 238 people had died in Sweida, a city in the south of Syria near the border of Jordan. Surprise and suicide attacks by ISIS decimated families and neighborhoods in this place that is mostly Druze, but Christians are there as well. At least one woman at the conference lives there, so she would know by name those who died and were buried today. Jesus is our hope. The sign has been given to us by others. Jesus is our reason for our hope. That is, and remains, our answer. Evangeline, Marilyn, Me and Sheryl on the center’s terrace for afternoon coffee. 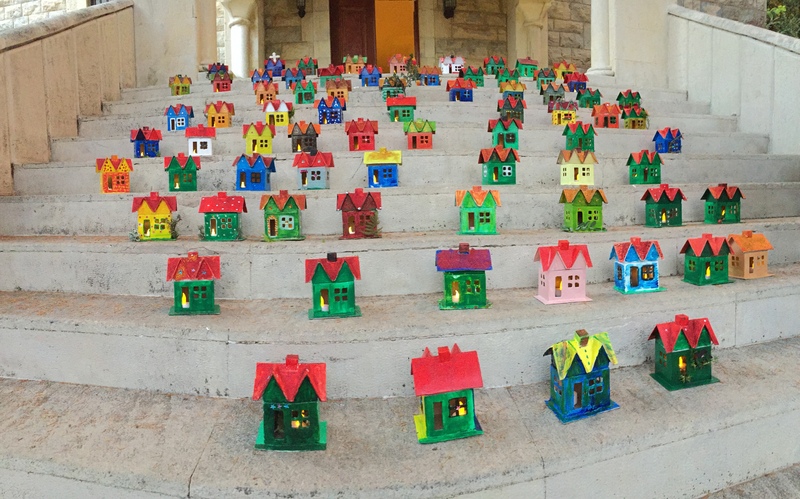 And so we gathered at the Cedar House tonight, little houses of hope lit from within, like the spirit of God lights us from within. We circled up for a prayer service, a community of hope. 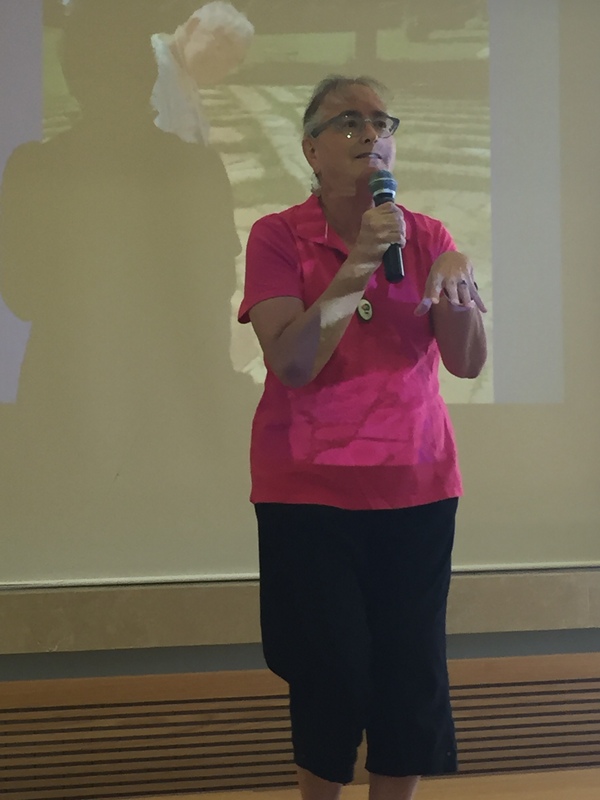 Sheryl opened us in English, and Arabic voices followed, as we prayed for couples, for children, for new families just forming, and for women. We punctuated each prayer by singing the Kyrie Elieson to a haunting Middle Eastern tune. Lord have mercy. Lord have mercy. Lord have mercy. Back now on the porch of the Carslaw House, we can look up the short road to Cedar and see the lights brightening the dusky night. Here there is hope. Here there is light. Here there is Jesus. I used to have the very good habit of making my lunch every day: Sandwich, fruit, two cookies. Sadly, those days have gone into history now. It was a good habit, though. Now, if I don’t remember to grab some of the always yummy leftovers we have in the fridge, I head for one of several great food choices in the neighborhood of the church. My favorites are the Chinese take-out places, of which there are four within just a few blocks, although I usually choose from one of two. A creature of other habits (making my lunch not being one anymore, as I said), I order one of two things: broccoli beef or sesame chicken with friend rice. It’s not healthy, but it tastes good. And the bonus that comes with it: the fortune cookie! No kidding! Steve and I once got the same fortune in our cookie at Sunday lunch. I have been saving these on my desk for some time now, and periodically look them over. What I have discovered is the messages come in several categories, such as actual predictions, advice for the short term, descriptions of me that I love and hope are true, a couple that I totally disagree with as far as describing me, and the balance are kind of common sense. And so for lack of anything better to talk about today, here are the messages from my fortune cookies over the last several years. Now is a good time to finish up old business. Channel your energy into something positive. Now is a good time to finish up old tasks. Looking at number one and number three, it seems recycling is happening in fortune cookies. Recycling is always good! You take an optimistic view of life. You have the ability to analyze and solve any problem. You have great physical powers and an iron constitution. You have musical talents. Make them known. You constantly struggle for self-improvement. You are vigorous in words and action. You have a natural grace and great consideration of others. You have an active mind and a keen imagination. You are a person of strong sense of duty. You are an exciting and inspiring person. You have a deep appreciation of the arts and music. 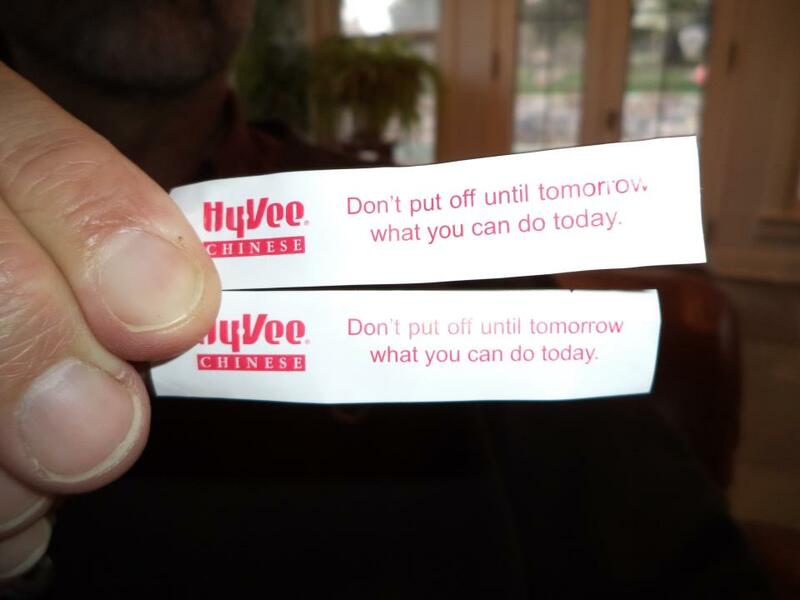 I don’t need fortune cookies to help me get through the day. I know who I am in God’s eyes and that is enough for me. But I can’t help smiling when I open these up and read them as I enjoy the sweet treat of the crisp cookie. I think it would be a great ministry to be the one who puts those encouraging messages into someone else’s dessert. Besides, now I know my lucky numbers, too!